1 photograph : b&w, taped to paper ; 5 x 7 in. Item is a photograph of Joe Pollender and Charles LaVerne of the McGill "A" team at the Canadian University Debating Championships in Halifax in November 1980. 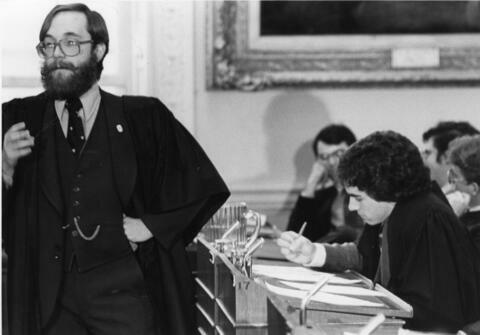 The photograph was taken by Tom Higgins for the Dalhousie Public Relations Office and appeared in Volume 11, Number 8 of the Dalhousie University News on November 6, 1980. Description created on November 23, 2015.